Roseville, CA and nearby cities. Appliance Repair Expert is able to provide same-day appliance service in Roseville and nearby cities on most days. We keep our trucks stocked with common appliance parts, which often enables us to complete repairs on our first visit. We’re a locally-owned, technician-operated appliance repair service. Our techs are some of the best in the industry, and when you call us you’ll be connected directly with a local appliance repair technician in the Sacramento metro area. Our service is consistently ranked among the most popular appliance repair services in the Sacramento metro area on Google & Yelp. Your total satisfaction is our priority and we look forward to serving your appliance repair needs! Appliance Repair Expert is a locally-owned, technician-operated appliance repair company providing residential appliance repair to the residents of Roseville, CA and surrounding cities. Our purpose is to provide a convenient and affordable alternative to appliance replacement, thereby saving major appliances from the landfill. We adhere to high standards of service: by providing quality service at low costs, we are Roseville’s most trusted source for appliance repairs! We depend on repeat and referral business to run an efficient operation, so your total satisfaction is our priority. We stand behind our work: all repairs are covered by our comprehensive parts and labor warranty. 1. Same-day appliance repair. If you contact us before mid-day, we can almost always provide same-day service. We’re open Monday – Friday, from 8 am to 8 pm, and Saturday – Sunday, 9 am to 8 pm. 2. 5-star rated service. Since opening up shop in 2006, we’ve established a name for ourselves as one of the most popular appliance repair services in the Sacramento metro area, with 100+ 5-star reviews on Google, Yelp and other third party review web sites. 3. Appointments that fit your schedule. Your technician will give you a courtesy call before the repair service, allowing you to go about your day as normal, even during the repair process. 4. Skilled appliance repair technicians. Appliance Repair Expert’s team of technicians undergoes extensive training before completing jobs independently, meaning you will have a technician whom you can depend on. 5. Reliable customer service. Call us during our business hours and you’ll be connected with a representative who can help you book an appointment or answer any questions you may have. We answer phones Monday through Friday, from 8am to 8pm, and Saturday through Sunday, from 9am to 8pm. 6. Comprehensive parts & labor warranty. We proudly stand behind each of our appliance repairs by providing a complementary 90-day parts and labor warranty. To ensure that your repairs will last, we use only original factory parts or high-quality aftermarket parts if original factory parts are unavailable. 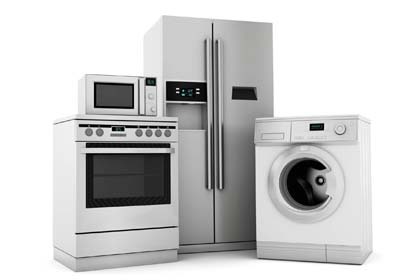 We provide residential appliance repair service spanning roughly from Auburn, CA down to Sacramento. We offer provide appliance repair in these cities: Antelope, Arden-Arcade, Auburn, Carmichael, Fair Oaks, Folsom, Granite Bay, Lincoln, Newcastle, North Highlands, Orangevale, Penryn, Rancho Cordova, Rio Linda, Rocklin, Rosemont, Roseville, Sacramento, and more. We repair major kitchen / laundry appliances: refrigerators, freezers, ice makers, cooktops, dryers, garbage disposals, dishwashers, microwaves, ovens, ranges, stoves, trash compactors, washing machines, and water heaters. Our appliance repair technicians are experienced with all of the most popular brands: Admiral, Amana, Bosch, DCS, Electrolux, Estate, Fisher & Paykel, Frigidaire, GE, Gibson, Hotpoint, Jenn-Air, Kenmore, KitchenAid, LG, Magic Chef, Maytag, Miele, Roper, Samsung, Sharp, Speed Queen, Sub-Zero, Tappan, True, U-Line, Viking, Whirlpool, Wolf, and more. We also offer repairs for most boutique / high-end appliance brands. Want to learn more about us? Visit our Services page to find out more about how our company works. Fair Oaks Lincoln Orangevale Rocklin ...and more!